Wild in spirit, Koji Wolfcub is the feral defender of the Spiral Jungle and those who call it home. Koji communes with the animals and elders of the Spiral Jungle alike, and both have come to respect the untamed power that drives him. 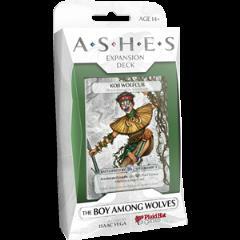 The Boy Among Wolves deck, Featuring new Phoenixborn Koji Wolfcub, is a full, ready-to-play Ashes expansion deck including 5 conjurations. Koji requires 5 Sympathy (teal) dice and 5 Nature (blue) dice to play, which are included in the Ashes: Rise of the Phoenixborn base set and the Song of Soaksend Deluxe Expansion.